It’s goodbye for Harlem’s Lenox Lounge, may it RIP | HarlemGal Inc.
← What’s up with the old Harlem Vintage space? The days are numbered for Harlem’s famous Lenox Lounge. 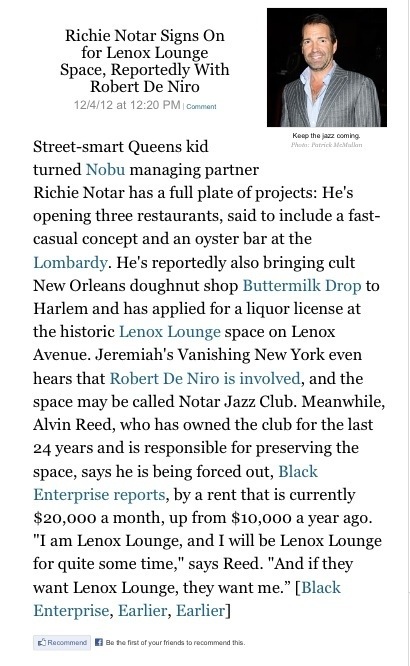 Grub Street.com double confirms today what Black Enterprise reported yesterday, which was the commercial space will now be rented out to Richie Notar. Also, the NYMag blog reports Robert De Niro is involved. See story below. 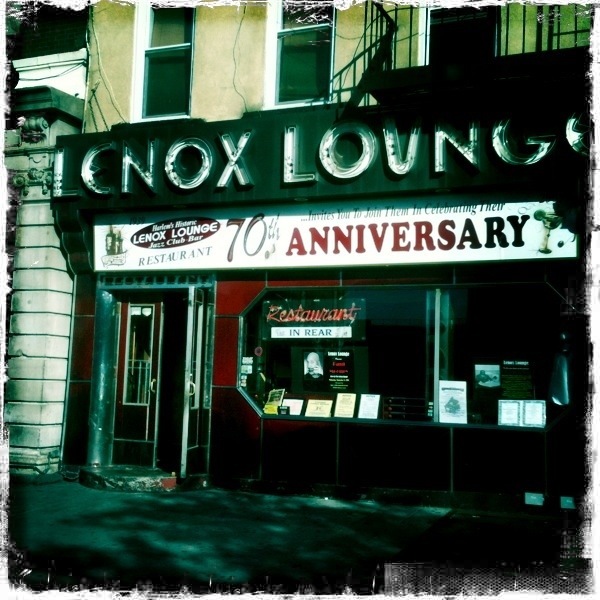 That’s it for Lenox Lounge in Harlem. It’s done. Over. Finished. Go there by December 31st to say your goodbyes. That’s the last day Lenox Lounge will be open! May it rest in peace. This entry was posted in 125th Street, Bars, business, food, Harlem, jazz, Lenox Lounge, restaurants and tagged Black Enterprise, BlackEnterprise, Grub Street, Harlem, Lenox Lounge, Richie Notar, Robert De Niro. Bookmark the permalink. Sad to see it go. Spent many lovely jazzy evening there. I wish they would keep the Lady Day Booth and the name of the lounge itself. It’s a landmark. I am so with you. It is such an American icon. Maybe the new owners will have mercy on the place and actually keep the name. We can all hope for the best….right? Since De Niro is allegedly involved hopefully he will be sensitive enough to keep the original feeling. As I would go to the back room for jazz sessions I loved walking through the bar with its juke box and dancing. Had a neighborhood feel. All that was missing was good PR. You can keep the name and even the music, but you can’t retain the spirit. Trust me, none of the new owners will give a damn about the locals who’ve supported this place over many decades.